Angel of the North is a very large steel sculpture of an angel, located in Gateshead near Newcastle upon Tyne. 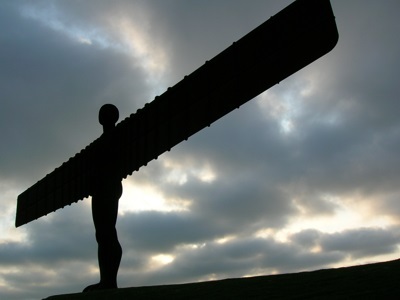 The sculpture was designed by the English sculptor, Antony Gormley, and constructed between 1997 and 1998. Construction of the statue cost cost of about £1 million - most of which was provided by the National Lottery. The sculpture is 65 feet (20 meters) tall, and has wings that measure 175 feet (54 meters) across. It is made from 200 tonnes of steel, and is anchored to the ground by more than 600 tonnes of concrete foundations.